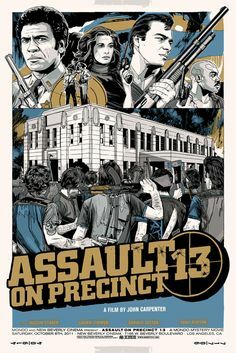 Brief Synopsis – A gang of criminals attack a deserted police station on the day before it is closed down which causes a police officer to work together with a few convicts and civilian employees to defend the station. My Take on it – This is a film that I have heard of for years yet never had the opportunity to see it and was curious to see what it was all about. The premise is quite simple yet they present it in such a way that they show how complex things can be in situations like this. They do a wonderful job pacing this film quite rapidly and that helps add to the thrilling elements of it all. The film is constantly adding more and more thrills from start to finish that keep things more tense as things escalate. They do a great job of teaming up characters who are quite different in their outlooks yet realize that they must work together in order to survive despite their differences. The choice to keep the enemy pretty much faceless works really well because it helps add to the tension of it all because the relentlessness of them is constant no matter how many of their own numbers are lost along the way. They do an excellent job showing the chaos of this kind of situation and how things can lose control so quickly. I recall seeing the remake f this a few years ago but don’t remember anything about it, so I probably should rewatch it at some point. Bottom Line – Great thriller that is paced so well throughout that it is able to give a non-stop thrill because things just keep coming and coming. The characters are all quite diverse which helps show how much they each overcome in order to begin working together. Loved the way that the enemy is almost completely faceless and relentless and isn’t willing to give up no matter the cost to their numbers. The chaos of it all works really well in showing how situations can get out of control so easily. Recommended!